Black and white negative showing the construction of the new sewage treatment plant. 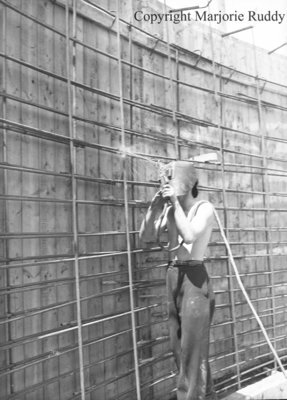 In this image, the worker is welding rebar on to the side of a wall. Construction of Sewage Treatment Plant, 1948, Marjorie Ruddy. Whitby Archives, A2013_040_1028.